Why bother with GPX files? Anyone used to written instructions will find it hard to appreciate the value of a 'sat nav' for walkers . True, it's more fun to unravel text or regul rly consult maps than follow an arrow on a device. 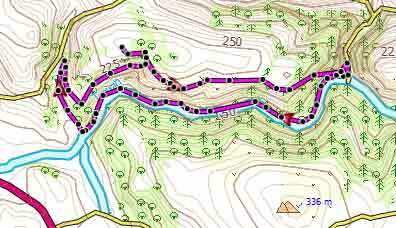 However, if you are tired of going wrong because of missing signs/clues or unclear instructions, a gpx file on a mobile or gps device 'forces' you to take the correct turn at the right time ,useful particularly in forests and open fields. 'Next, cross the field to a stile in small gap in hedge..
How many of us have followed hedges just to locate a stile? Your mobile should automatically select the appropriate app , ie Locus Map or OSMAnd. 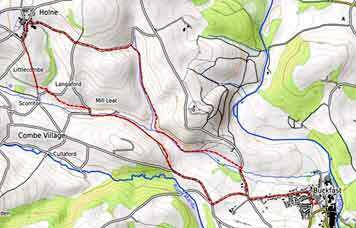 When you switch on your gps you can see your position and that of the 'route line'. You walk towards the nearest point on the 'route line' until you are on the route itself. Without a gps you often need to 'get your bearings',particularly if you have parked away from the suggested parking area! I have downloaded a gpx file - now what ? Why is is zipped in the first place? Unfortunately , some browsers including IE , when trying to read a gpx file if unzipped, open it as text , which is very confusing. Basecamp will show your gpx but it needs a map of the area. We have produced a free map of Devon which can be downloaded and installed on Windows. How to display KML files? When double clicking on a KML file , your computer automatically opens it on Google Earth. Search the net for Google Earth (FREE) ,then download and install. All our kml files show starting direction in Cyan - see map. 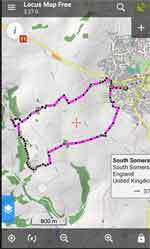 What are the best satnavs for walking? For more information and what to look for when buying a GPS read this artcle.